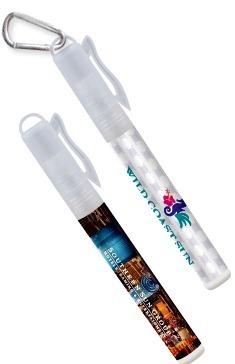 Sunscreen Spray Pens with Clip, customized with your logo in full color. Budget Prices in USA and Canada for wholesale pocket sunblock sprays . We also supply blank (not imprinted) sunblock sprays for $1.35 each. American clients pay no taxes. We will send you a proof for your approval before production. Unit prices below include your full color custom imprint. Setup Charge is $45.00 per order. We also supply blank (not imprinted) sunblock sprays for $1.35 each (minimum 250). Optional Carabiner: add $0.24 per sunblock spray. Set-Up Charge : $45.00 for full color imprint. Protect your skin with this maximum protection, SPF30 Sunblock Spray. This sunblock is made in the USA and is FDA approved and always includes SPF30 protection. Includes full color process wrap decal for your retail look. Easy to apply and non-greasy. Great for any outdoor event such as golf course, picnic, or a day at the beach. Lightly scented: Tropical.